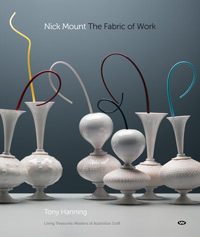 Nick Mount The Fabric of Work is richly illustrated with photographs of Nick's pieces, including many made recently. These vibrant works range from the extraordinary flamboyant scent bottles to more recent wood and glass fruit pieces that reflect a lush quietude. Wakefield Press is an independent book publishing company based in Adelaide, South Australia. Nick Mount is an iconic figure in the hothouse of contemporary glass. He has been in the vanguard of the studio glass movement in Australia since the 1970s, both as a brilliant exponent of the creative possibilities of hot glass and as a mentor and inspiration to emerging glass artists. Mount has freely adapted traditional hot glass techniques to produce a distinctive and coherent body of vessels and sculptural forms that are distinguished by incandescent colour and compelling physical presence. This book traces his career so far and features the work he is best known for, including his stunning Scent Bottles series, in sumptuous full colour.